The Queen Marie Antoinette Pearl and diamond pendant, from the 18th century, is displayed at Sotheby’s, in New York on Oct. 12. 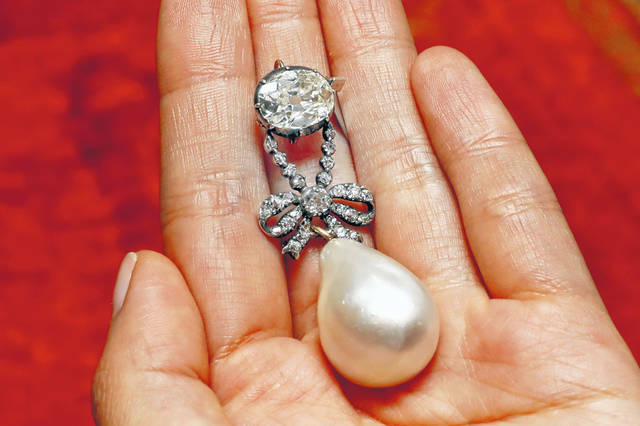 The large, drop-shaped natural pearl pendant sold for a hammer price of $32 million at an auction of jewelry that once belonged to French queen Marie Antoinette, which Sotheby’s is calling a record price for a pearl at auction. GENEVA — A large, drop-shaped natural pearl pendant sold for a hammer price of $32 million at an auction of jewelry that once belonged to French Queen Marie Antoinette, which Sotheby’s is calling a record price for a pearl at auction. The “Queen Marie Antoinette’s Pearl,” a diamond-and-pearl pendant, was among the highlight offerings on the block at the Sotheby’s sale of jewelry from the Bourbon-Parma dynasty. Like many of the 10 former Marie Antoinette pieces up for sale on Wednesday, the pendant obliterated the pre-auction — in its case, $1 million to $2 million. The total tally was expected to rise with the inclusion of the “buyer’s premium” and other fees. Sotheby’s billed the sale as a once-in-a-lifetime chance to scoop up heirlooms and jewels that have been held in the Bourbon-Parma dynasty for generations. Some of the Marie Antoinette jewelry hadn’t been seen in public for 200 years — until now. The diamond and pearl jewelry that went under the hammer epitomized the aloof, pre-Revolutionary opulence of French royals brought down by the historic uprising. Marie Antoinette, the wife of King Louis XVI, was executed in France’s revolutionary fervor in 1793. Before falling to the guillotine, she had secretly smuggled abroad some of her most treasured possessions to her relatives, amid swelling revolutionary fervor that ultimately marked the beginning of the end of France’s centuries-old monarchy. The queen’s jewelry also included a set of pearl and diamond earrings, a diamond brooch, and a natural pearl and diamond necklace. A monogrammed, diamond-set ring bears a lock of Marie Antoinette’s hair.